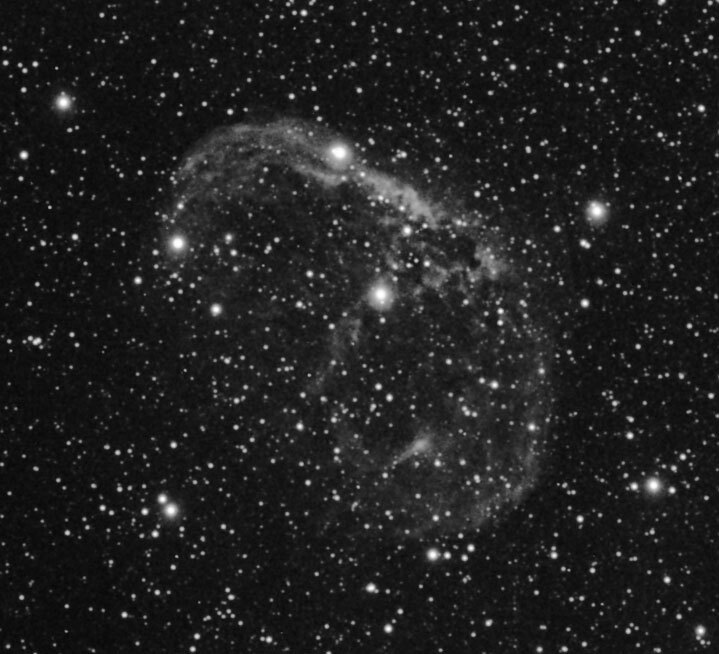 Mike Lancaster produced this image of part of the Crescent Nebula on the 4th October 2014. It is a stack of four 300 second exposures taken with a Mallincam Xtreme X2 colour camera at AGC 4 through a 10" Meade LX200 ACF SCT on an NEQ6 PRO mount using an MFR-5 focal reducer and Astronomik CLS CCD filter. The image was guided using a Lodestar camera through a piggybacked 80mm APO. Image capture was using Miloslick Mallincam Control software. Stacking and some processing was performed in Nebulosity v3.2. Additional processing was performed in Photoshop Elements using Gradient Xterminator and Astronomy Tools. The following image by Adrian Brown is a false colour composite that combines images taken with Astronomik 6nm hydrogen alpha and 13nm oxygen III filters. The hydrogen alpha is assigned to the red channel, OIII to the blue and a synthetic green channel was created from both the hydrogen and oxygen data. The individual exposures used to create the image were taken over 4 nights (31st May, 1st, 2nd and 4th June 2006). 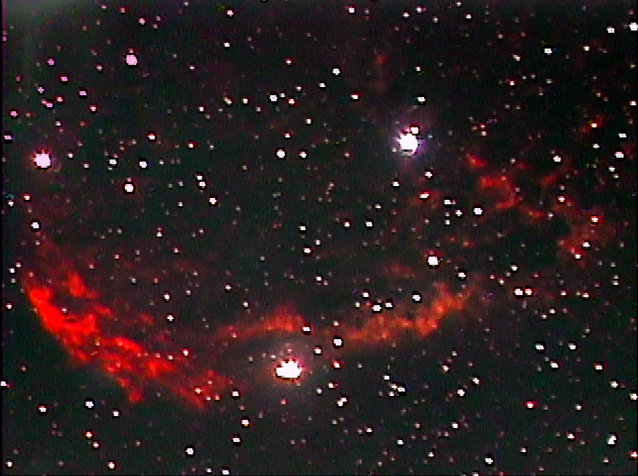 The hydrogen alpha and OIII component images are shown below this tri-colour composite. Adrian used a Skywatcher 80ED refractor and an ATIK ATK16HR camera. CCD autoguiding was via a Skywatcher 80T refractor and an ATK-2HS camera. The sub exposures were calibrated, aligned and combined in Maxim DL. Adobe Photoshop processing consisted of levels and curves, a high pass filter to sharpen the nebula and a gentle Gaussian blur to smooth any residual noise in the background. Adrian used the same technique as with his image of the Heart Nebula taken the year before. Adrian notes that: "It’s quite interesting to compare the hydrogen and oxygen data and see where the gas is distributed. I gather there is quite an extensive oxygen halo that surrounds the nebula. I found this image on the net which shows it quite clearly: http://www.astrodon.com/oldsite/NGC6888HiRes.html. 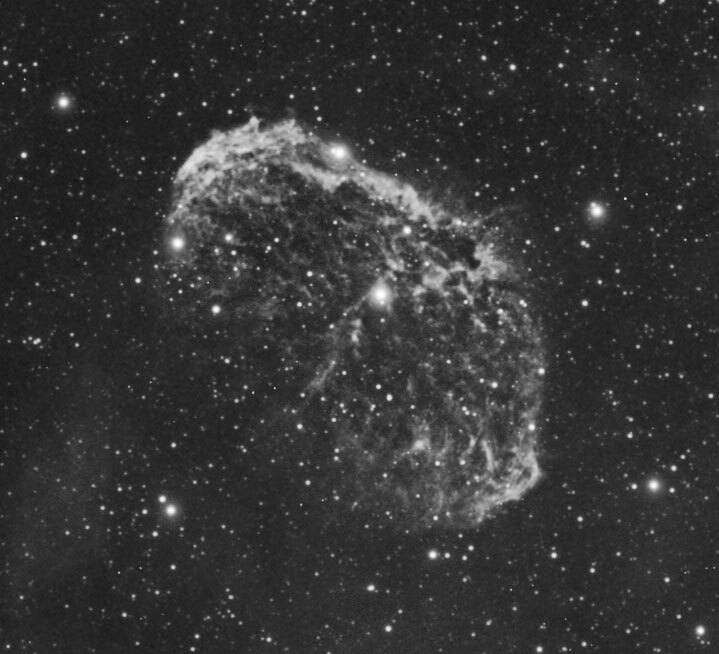 To create the following image of Caldwell 27 (NGC 6888) Adrian Brown used an Astronomik 6nm hydrogen-alpha filter and captured thirteen 15 minute exposures over 3 nights (31st May, 1st June and 4th June 2006). Adrian used a Skywatcher 80ED refractor and an ATIK ATK16HR camera. CCD autoguiding was via a Skywatcher 80T refractor and an ATK-2HS camera. The sub exposures were calibrated, aligned and combined in Maxim DL. Adobe Photoshop processing consisted of levels and curves, a high pass filter to sharpen the nebula and a gentle Gaussian blur to smooth any residual noise in the background. 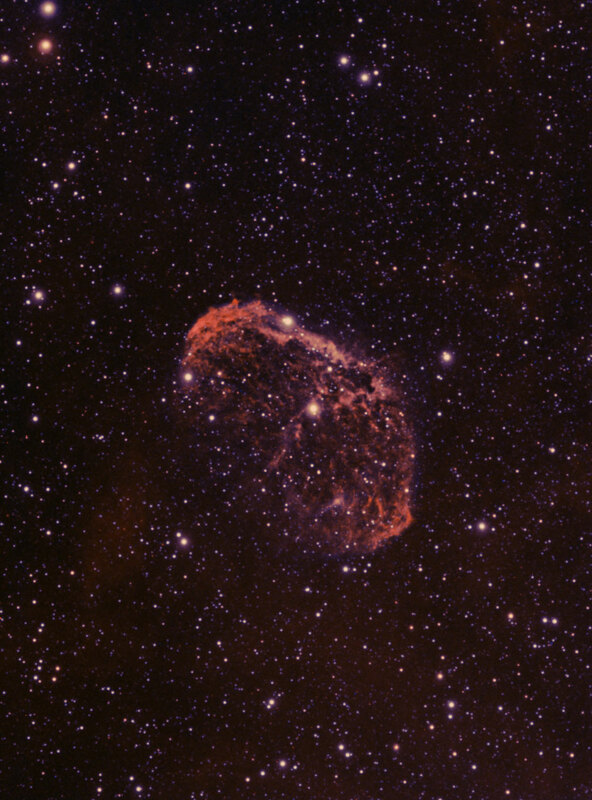 Adrian Brown captured the following image of Caldwell 27 (NGC 6888) on the 2nd June 2006 using an Astronomik 13nm oxygen III filter. The image was created from six 20 minute exposures using a Skywatcher 80ED refractor and an ATIK ATK16HR camera. CCD autoguiding was via a Skywatcher 80T refractor and an ATK-2HS camera. The sub exposures were calibrated, aligned and combined in Maxim DL. Adobe Photoshop processing consisted of levels and curves, a high pass filter to sharpen the nebula and a gentle Gaussian blur to smooth any residual noise in the background. 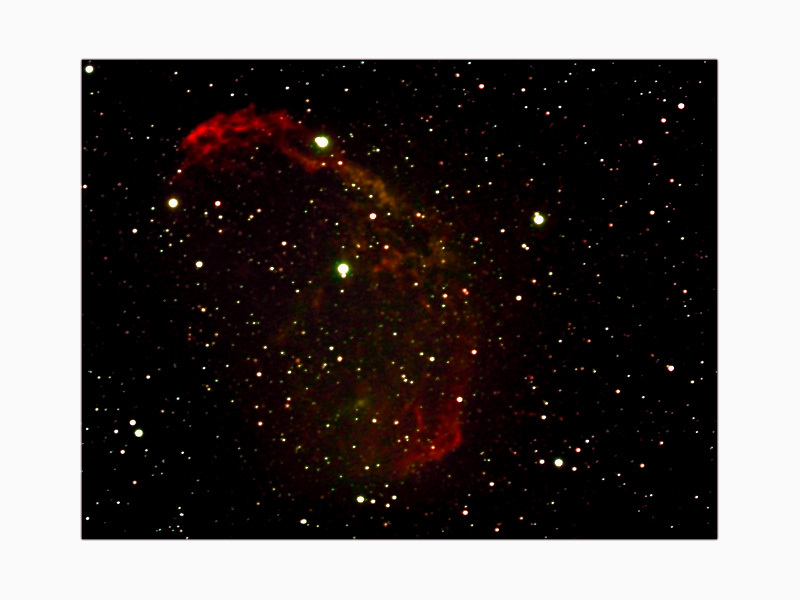 Adrian Brown produced the following image of the Crescent Nebula in Cygnus on the 15th July 2005. He used a Skywatcher EvoStar 80ED refractor with an ATK-2HS camera, an Orion SkyGlow light pollution filter and Astronomik LRGB filters. The LRGB image is comprised of 7 x 5 minute exposures through a Luminance (clear) filter, 4 x 5 minute exposures through a Red filter, 3 x 5 minute exposures through a Green filter and 5 x 5 minute exposures through a Blue filter. To help with tracking accuracy, he used a C11 SCT / ATK-1C camera combo as a guidescope along with a freeware program called GuideDog to auto-guide the mount. K3CCDTools was used to capture and stack the images and then final image processing was done in Maxim DL 4.11 and Photoshop 7.